Waylande Gregory’s monumental Fountain of the Atom, created for the 1939 New York World’s Fair, was a playful symbol of one the twentieth century’s most profound scientific developments. Illustrating the fair’s general theme, “Building the World of Tomorrow with the Tools of Today,” the artist contrasted ancient and modern concepts of science on the two tiers of the fountain. On the bottom tier Gregory personified the atom’s electrons as eight exuberant boys and girls dancing with lightning bolts about the nucleus, a central shaft surmounted by a gas flame. Around this shaft on the top tier were four colossal figures, Fire, Earth, Air, and Water, personifications of the elements as defined by the ancient Greeks. Water, a self-portrait of the artist, is depicted as a young swimmer accompanied by smiling maroon fish diving out of a swirling waterfall. 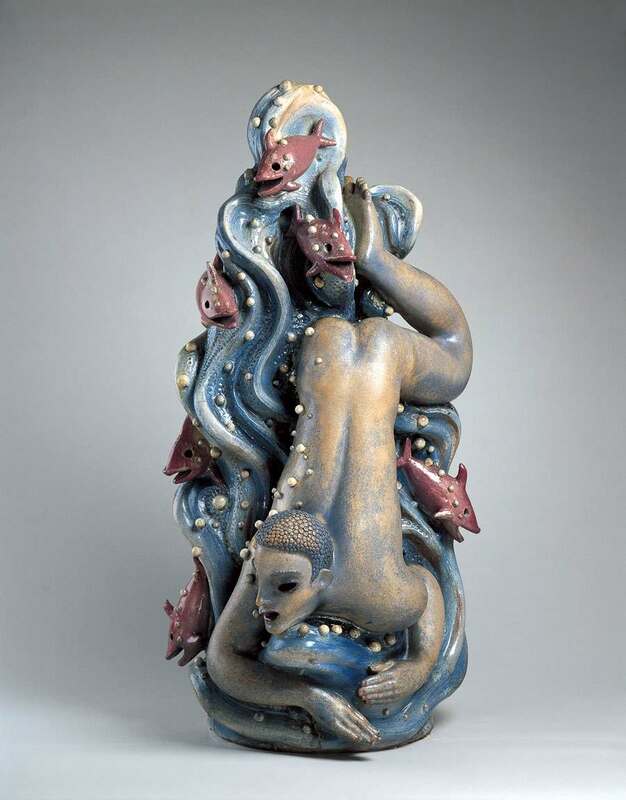 Gregory, whose brief tenure at Cranbrook was cut short by the onset of the Great Depression, ultimately gained recognition in the 1930s and 1940s as one of America’s foremost ceramic sculptors.